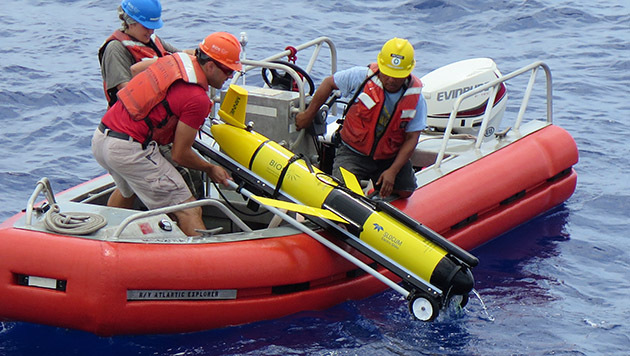 Marine techs and crew of the R/V Atlantic Explorer retrieve an AUV offshore Bermuda. 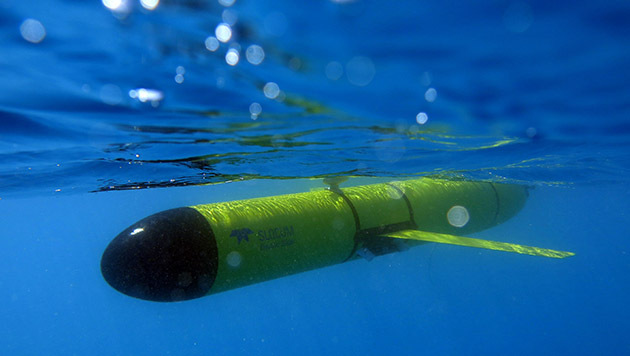 In 2014, BIOS acquired its first AUV, a Slocum glider manufactured by Teledyne Webb Research, named “Anna” by BIOS scientists. The Conductivity, Temperature, Depth (CTD) rosette aboard the R/V Atlantic Explorer. 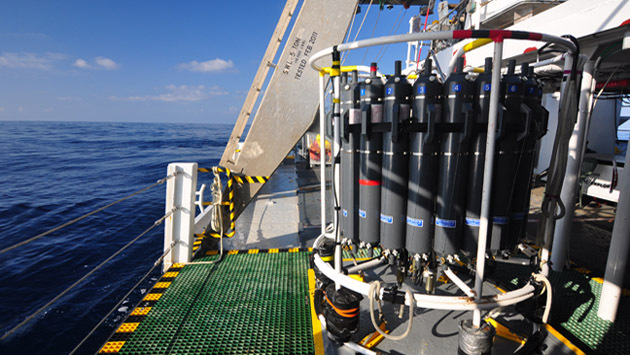 The Bermuda Atlantic Time-series Study (BATS) was established to help scientists address questions about the ocean by collecting data on important physical, chemical, and biological parameters throughout the water column at multiple sites within the Sargasso Sea. The waters offshore of Bermuda are at the crossroads of major ocean currents originating from as far away as the Arctic and Antarctic Oceans. 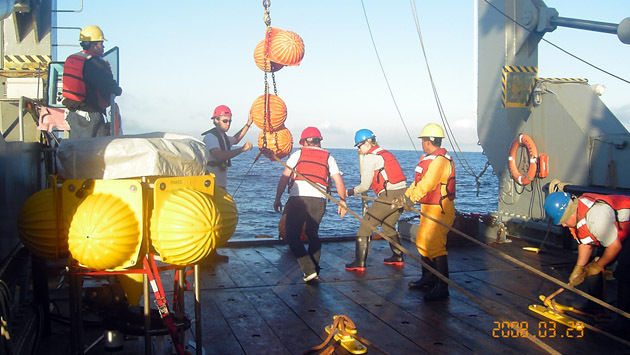 To understand the complex interconnected ocean system and the role the ocean plays in sustaining life and modulating Earth’s climate, long-term measurements are required. 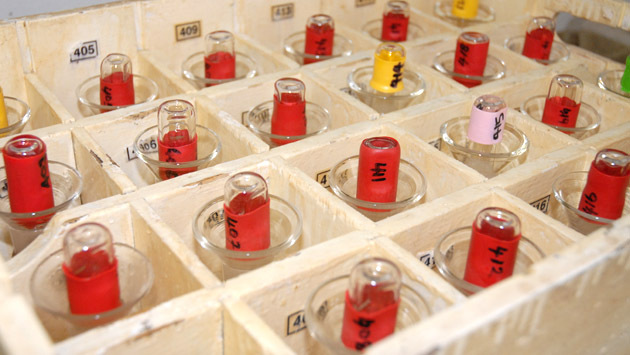 Established in 1954, Hydrostation S is the longest-running dataset of its kind in the world, acquiring measurements of the ocean’s physical properties every two weeks. The Oceanic Flux Program (OFP) has been collecting small organic matter on a weekly-to-monthly time scale since 1978. Knowledge of this small organic matter is critical to understanding the basis for life in the ocean. The Bermuda Atlantic Time-series Study (BATS) has collected data on the physical, biological and chemical properties of the ocean every month since 1988. The Oleander Project is a novel partnership that leverages the container ship Oleander as a "volunteer observing ship" to collect oceanographic data during its weekly travel between Bermuda and New Jersey. 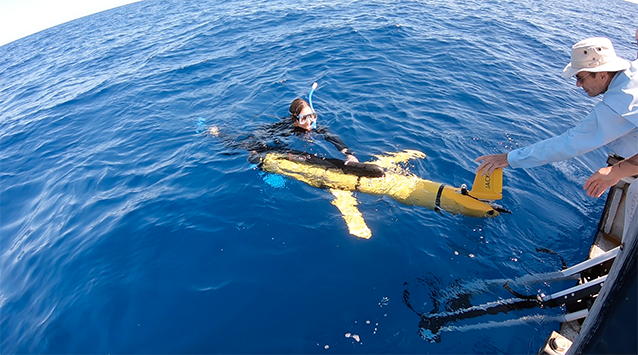 To complement these long-standing ship-based measurement programs, BIOS has more recently acquired a small fleet of autonomous underwater vehicles to conduct high-resolution surveys of the ocean. 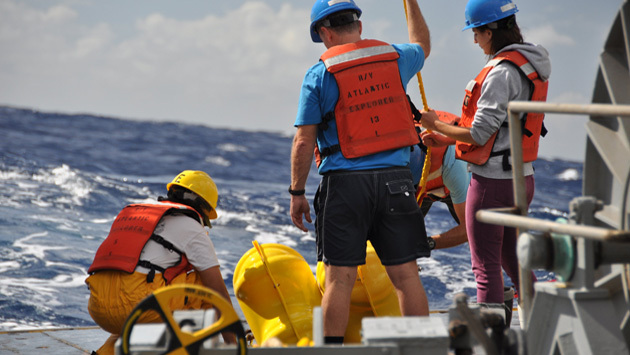 The Mid-Atlantic Glider Initiative and Collaboration (MAGIC) was established in 2014 and currently has three gliders in its fleet, capable of acquiring continuous measurements of the ocean to depths of 1000 meters for months at a time.